When I woke up this morning, I had a really nice surprise waiting for me in my inbox. An e-mail telling me that my wedding photos had won the bouquet tossing category in the latest WPJA (Wedding Photojournalist Association) quarterly contest! WPJA is the worlds biggest organization for wedding photographers, and there are tens of thousands of photos sent to every competition they hold. This was the third time so far that my photos were places on the 1st place in their competitions, which is more than any other photographer has accomplished in Finland or actually in the whole northern Europe. Below is the winning photo with one judges comments. This wedding couple had planned this wedding for several years, and the budget wasn’t very small either. Despite big and detailed plans for the wedding day, the most important thing is the wedding couple. This was truly the case with Kiira and Pete, as you could see the love between them throughout the day. One of these moments was the First Look moment at Hotel Kämp, where Pete was waiting for Kiira at the lower end of the stairs. The reception at restaurant Kitzens, which is located in the heart of Helsinki, was full of details from James Bond movies, like a lamp in the shape of a golden gun. James Bond movies (and movies in general as well) were the theme for this wedding, which was very apparent when the couple started their wedding dance. The song the band played was the theme from Skyfall. The coreography was amazing! Näitä häitä suunniteltiin Kiiran ja Peten toimesta vuosia, eikä budjettikaan ollut aivan pienimmästä päästä. Upeista puitteista ja tarkoista järjestelyistä huolimatta tärkeintä hääpäivässä on aina hääpari, eikä tästä hääpäivästä puuttunut rakkautta heidän väliltään. Jo heti First Look -kuvauksissa hotelli Kämpissä oli tunteet pinnassa, kun Pete odotti portaikosta saapuvaa Kiiraa. Itse hääjuhlassa, joka järjestettiin Ravintola Kitzenssissä, kaikki yksityiskohdat oli mietitty todella hienosti ja teemana oli elokuvat, erityisesti James Bondit. Häätanssina oli Skyfall -elokuvan tunnusbiisi, ja koreografia oli mitä hienoin – puolessavälissä konfetit täyttivät tanssilattian leijuen ylhäältä alas. Tunnelma oli mitä mahtavin! absolutely gorgeous! you were a stunning bride! Jennifer & David are working here in Finland for one year, after which they are returning to Canada. They’re planning to get married next February in Toronto with their friends and family there. These engagement photos were taken at Helsinki Cathedral, Esplanad park and Helsinki railway station. This lovely couple were preparing for their big day at hotel Seurahuone, which is located right in the city center of Helsinki. The morning was full of laughter as the bride and maids of honor were running around and getting ready for the ceremony. Helsinki Cathedral was the church where Susanna and Teemu said Yes to each other, and shortly after that we were taking to wedding portraits near the church and at Katajanokka. Yesterday was the wedding day of Kiira and Pete, who had a James Bond themed wedding in Helsinki city center. Here is a sneak peek into their wedding through one quickly edited portrait, which was shot at the Helsinki railway station. This and all the other portraits I took of them are a little bit more “edgier” than my normal style, because I really wanted to show the somewhat darker mood of the latest Bond-films in their wedding portraits. 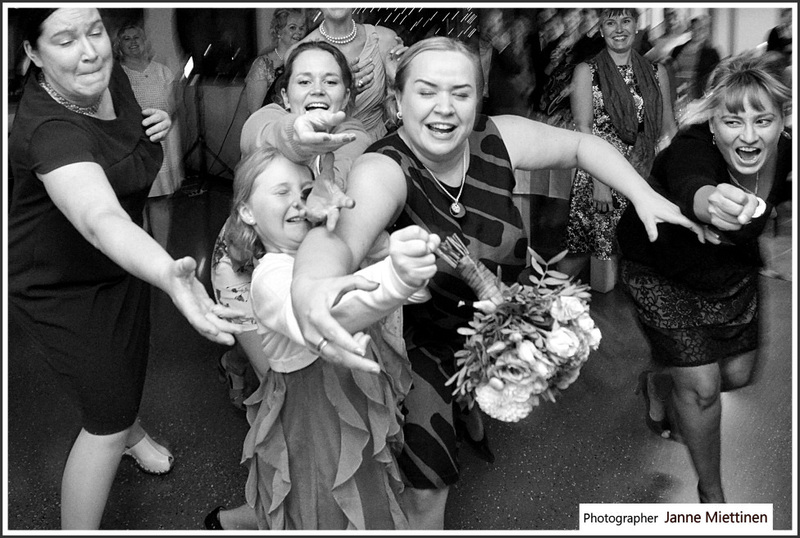 There are a few wedding portraits from the wedding day of Jonna and Torben in this blog, but here come the documentary photos from their wedding day. Their wedding venue, Restaurant Saaristo, is a really nice place to have your summer wedding at. The old building has big windows and the light just floods in through them. 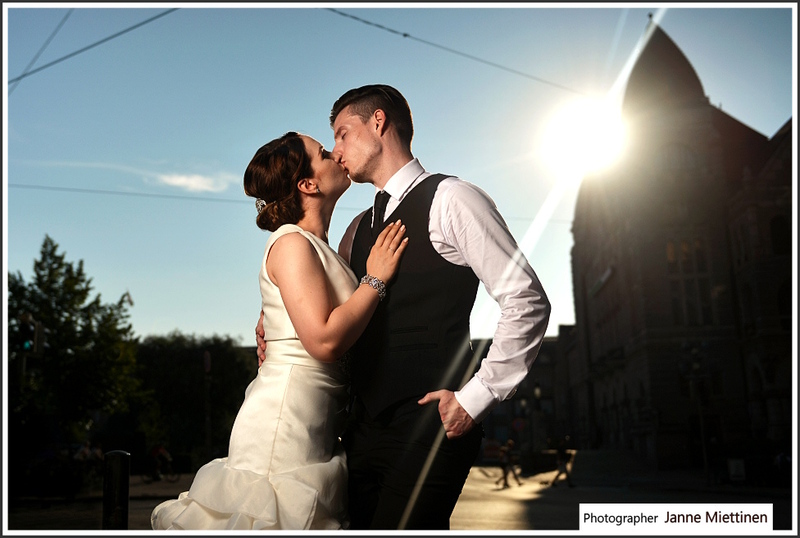 Below are three fresh photos from a wedding portrait photoshoot, where we went from Töölönlahti to the city center streets of Helsinki. Their wedding was held in front of Helsinki Harbour, on the small island of Klippan. Here is a sneak peak to their wedding day through a few portraits, but more will follow later on.